MANILA, Philippines — Another Filipina delivers an Asian Games gold medal for the Philippines. 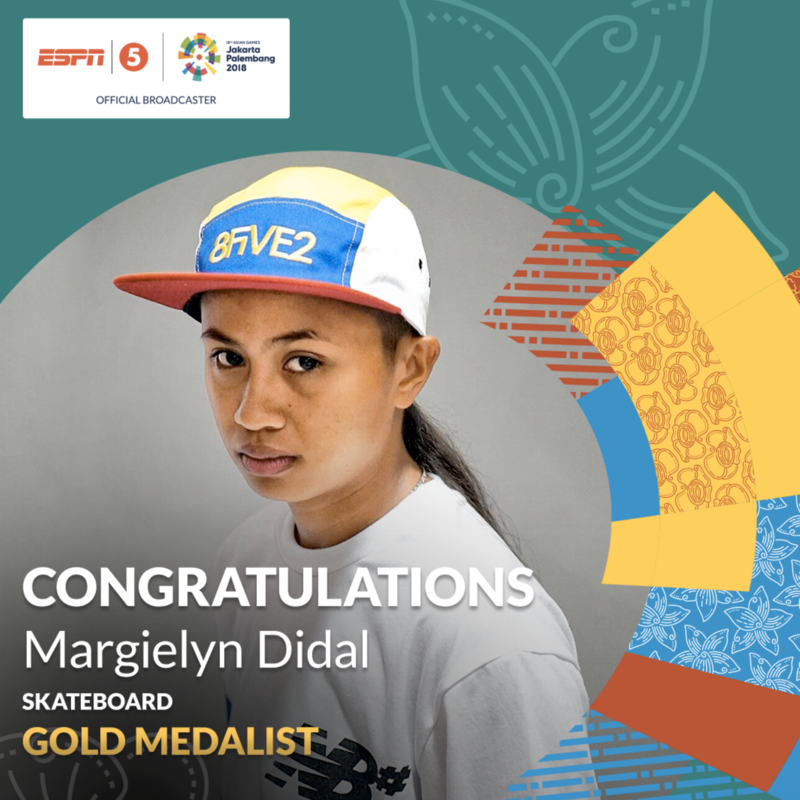 Margielyn Didal of Cebu proved to be as good as advertised after reigning supreme in quadrennial meet’s women’s street skateboarding tiff at the JSC Skateboard Stadium on Wednesday afternoon in Palembang, Indonesia. The 19-year-old Didal bested Japan’s Kaya Isa and the host country’s Bunga Nyimas. The Filipina garnered a score of 30.4 to top Isa’s 25.0 and Nyimas’ 19.8. Didal was penciled as one of the favorites to snag a medal for the Philippine delegation. The Skateboard Association of the Philippines Inc. liked the teener’s prospects in the event, which made its debut it the Asiad this year. The Filipina skateboarder was coming off overseas stints at World Xtreme Games in Minneapolis, and at the Skateboard Camp at Camp Woodward in Pennsylvania. She also competed in the Street League Skateboarding PRO Tour in London. Didal joins weightlifter Hidilyn Diaz, and golfers Lois Kaye Go, Bianca Pagdanganan and Yuka Saso as the only harbingers of the top honors for the Philippines in the continental event. Skateboarding will also make its debut in the Olympics in Tokyo in 2020.